We are very excited to welcome you to Residence Life at Texas A&M University! To help make your transition to college life as smooth as possible, move-in information will be posted here throughout the Fall semester. Don’t forget to check your TAMU email frequently so you don’t miss important emails – like more detailed instructions for move in based on your building or hall. Here you will find information about early move in information for Residence Halls, Apartments and Corps Housing. 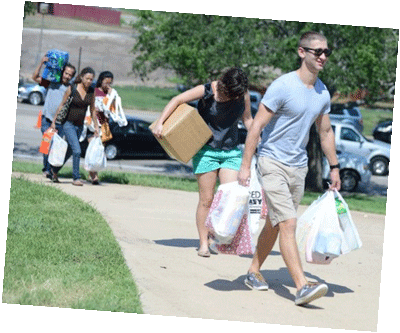 Early Move-In varies if you are in Corps of Cadet Halls, Residence Halls, or Apartments. All Early Move-Ins require a request. If a request for early move-in is approved, there is a fee associated with moving in earlier than the published move-in Dates. Earliest arrival dates and procedures vary by community. Visit our procedures page to learn how to request early move-in. Living in a community space can be a lot of fun. To make sure our buildings are as safe as possible we have some items that we recommend every student bring, and items that are prohibited in the our facilities. Please review this list carefully before packing and coming to campus. You can find more specifics in our resident handbooks. We also provide some extras you may want to purchase or rent. These Add-Ons include refrigerator/microwave combo appliances, linen packages, personal safes, and more. Find the details under the Add-Ons on our Amenities page. Below is a relatively complete list of all required and desirable packing items provided to Freshman Cadets. Please note more specific instructions will be provided by the Corps of Cadets Operations & Training area. Please direct questions to the Corps Area Housing Office. All on-campus residents must complete a mandatory online Annual Housing Orientation prior to moving into your residence hall or prior to scheduling your apartment check-in appointment. Once this has been completed students will visit a series of stations where they will be checked in to our data management system, pick up and sign for keys/room inventories, and receive information regarding unloading zones and subsequent parking. The orientation and check-in processes vary slightly by the type of residential community: residence halls, apartments, or Corps of Cadets so please take a closer look at the information and links provided in the toggles below. All residence hall residents must complete a mandatory online Annual Housing Orientation prior to moving in or Residence Life staff will not be able to issue you your room key. Instructions for completing the orientation were emailed to your TAMU student email account and are available at How-To’s & Procedures under the Annual Housing Orientation toggle. Check-ins takes place at the location indicated in the table below. Hall offices are located on the first floor of each of the residence halls. Building signage and/or staff members will direct you to the check-in location. Find your residence hall on our campus map. Physical addresses of the hall can be found on the individual hall page. Please bring a picture ID card to check-in (TAMU Student ID Card, Driver’s License, Passport, etc). You will need your TAMU Student ID Card to access the building after 6:00 pm on move in days. All apartment residents must complete a mandatory online Annual Housing Orientation prior to scheduling a check-in appointment or you will not be able to schedule a check-in appointment and Residence Life staff will not be able to issue you your apartment key. Instructions for completing the orientation were emailed to your TAMU student email account and are available at How-To’s & Procedures under the Annual Housing Orientation toggle. Check-In will occur in your respective apartment office shown below. Please bring a picture ID card to check-in (TAMU ID Card, Driver’s License, Passport, etc). If you do not have your TAMU ID card, then you will be issued a temporary card until you get your TAMU ID card. The Gardens Apartments Office: is located in the Community Center in the center of the apartments complex. The Gardens Apartments are located at University Drive and South College Avenue near the Engineering Complex. Physical address: 250 Calvin Moore Avenue, College Station, TX 77840; 979.845.2261. White Creek Apartments Office: is located in the Activity Center at the southeast corner of Building A in the center of the apartment complex. White Creek Apartments are located on West Campus near the Agriculture and Life Sciences Buildings. Physical address: 225 Discovery Drive, College Station, TX 77845; 979.458.8500. If you have questions or concerns, please contact your respective apartment office. All Corps of Cadets residents must complete a mandatory online Annual Housing Orientation prior to moving in or Residence Life staff will not be able to issue you your room key. Instructions for completing the orientation were emailed to your TAMU student email account and are available at How-To’s & Procedures under the Annual Housing Orientation toggle. Check-in takes place at various locations on the Corps of Cadets Quad. Building signage and/or Corps Leadership will direct you to the check-in location. Refer to our Move-In Dates calendar above for specific move-in dates for Corps groups. Please bring a picture ID card to check-in (TAMU Student ID Card, Driver’s License, Passport, etc). Residence Life has determined that 3M Command Strips and poster putty can damage room walls in Hullabaloo Hall. All rooms in Hullabaloo have bulletin board strips on the walls for hanging posters, papers, etc. Blue painters tape or gaffers tape are also options for hanging posters or other light-weight hangings. Please consult with your hall staff for additional alternatives.